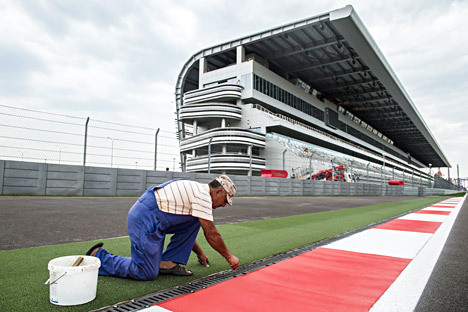 Two months ahead of Russia's first Formula 1 race, the finishing touches are being applied on the Sochi Autodrom. The finish line is in sight – or should that be the start line? Two months away from hosting Russia’s first Formula One Grand Prix on October 12, the Sochi Autodrom circuit is ready to go. The 3.6-mile (5.8 km) track winds around several of the venues from February’s Winter Olympics. The asphalt has been laid, the race control building is packed with high-tech gear and the stands are waiting for up to 46,000 spectators. “Everything is in an extremely good condition. Everything has been done to the highest standards and I’m extremely pleased,” said F1 race director Charlie Whiting, the man who has the final say over whether a track is fit to host top-level racing, in comments released by Sochi Autodrom. The change is remarkable. When I first visited Sochi’s Olympic Park in December 2012, our press tour bus took us along part of the route for the F1 track – or tried to. Back then, it was a partly-excavated dirt track littered with construction workers’ portable toilets and plastic chairs. The bus splashed into puddles and rolled alarmingly before the smiling guide decided we’d be better off on a rather more complete piece of roadway. Now, the track surface is smooth, gleaming asphalt, the perfect surface for F1 cars’ tires to grip as they surge round the Autodrom’s 19 turns. “I can say without hesitation that the circuit is ready 60 days in advance, which is very rare really,” said Whiting. Indeed it is rare. Several new F1 tracks in recent years have experienced disastrous construction problems, financial trouble, or crashed into barriers of bureaucracy. In 2010, South Korea’s Yeongnam track was only passed fit 11 days before the start of its first F1 race weekend. It was dropped from the F1 calendar last year after just four races following poor attendance, around the same time that a similar fate struck another new addition, the Indian Grand Prix. Those races and others may have stopped at the side of the road, belching smoke from a broken engine, but Russia’s sleek new challenger has some tricks under the hood, most importantly turbocharged government support. The Russian government keeps sports under tightly centralized control and the Sochi F1 race is a key part of its Olympic legacy plans for Sochi. The Russian Grand Prix will be by far the biggest post-Olympic sports event to be held in the city until World Cup soccer games are played there 2018. If the race fails, it would weaken the whole business case for the Sochi Olympics, so the government is unlikely to let that happen. Hosting the race in Sochi has helped save on costs, as part of the track design could be built into the Olympic construction plans as access roads. Spectators arriving at Olympic events in February walked past the pit lane buildings, temporarily serving as a makeshift exhibition center for Russian companies and headquarters for the Olympic volunteers. As a result, the government says it spent in the region of $200 million to build the track, a reasonably low figure. The flip side of using the Olympic Park is that, while the roads are there, having to use them seems to have rather limited track designer Hermann Tilke’s scope for creativity. The map of the track shows few obvious places where thrilling overtaking moves could take place, with much of the circuit comprising short bursts into right-angled turns around Olympic arenas, rather than the long straights and flowing curves drivers adore. The Olympic venues certainly bring glamour to the track, while nearby hotels that once accommodated speed skating fans now prepare to welcome those who prefer their racers to be petrol-powered. However, there’s an element of risk too. Big crowds turned up for the Sochi Olympics and Paralympics despite its 850-mile distance from Moscow, but race organizers need to ensure race fans make the trip. Organizers say 30,000 tickets out of 50,000 have been sold so far, and crowds of 50,000 at a DTM race at Moscow Raceway last week, a record for motorsport in Russia, show it can be done. The crisis in Ukraine has added its own share of problems, with calls from some British politicians that the race should be boycotted. Sochi is less than 200 miles from the nearest point in Crimea, and 320 miles from the war-torn city of Donetsk. However, a boycott seems highly unlikely. Formula One Management boss Bernie Ecclestone has tight control over the teams and has shown no sign of reconsidering his plans. Sources tell me he also greatly admires Russian President Vladimir Putin for what Ecclestone considers his similar managerial style – the sort of personal tie that could resist political tension. Even bringing F1 racing to Russia in the first place is something of a triumph. Efforts to start racing in Russia date back over three decades, even before then-communist Hungary became the first Eastern bloc country to host a race in 1986. The Soviet bureaucracy put paid to those early efforts, before plans for racing in Moscow in the 1990s and 2000s failed due to lack of funds. Whatever happens, Sochi’s F1 race will certainly make history and may already be setting a trend. From 2016, the capital city of Baku in the former Soviet state of Azerbaijan will host a race too. Meanwhile, for Sochi much of the hard work is already done. Almost all that remains now is to sit back and watch the race.